The Going-to-the-Sun Road isn’t the only beautiful route in our neck of the woods. 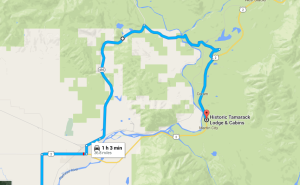 Meander a little and check out these three alternative ways to get to the Lodge to experience the beauty of Northwestern Montana the way the locals see it. This route is actually the fastest, but most people head through Columbia falls on Highway 2 (pictured in grey). Instead, turn left out of the airport parking lot on La Salle and then cut left on Highway 35, making another left on Highway 206. The elevated two-lane road will take you through farmland framed by mountains rising up in the distance before joining back up with Highway 2, where you take a right and beeline for the lodge. Slow down to Montana speed with this hour-long trip through the scenery. 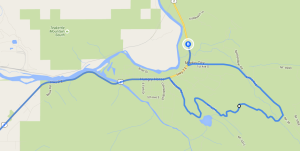 Head toward Columbia Falls, but instead of continuing on Highway 2, drive through downtown to meet up with 486. This old highway will take you through the foothills, winding through forests and natural areas until you reach Blankenship Road. 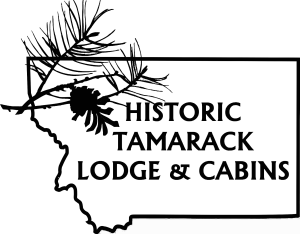 Turn right and pass the historic barns and cabins until you cross the Middle Fork of the Flathead River, then hang right on Belton Stage Road, continuing to Highway 2, were you’ll take another right and find the lodge on the left after you pass through the town of Coram. Start your trip off with a good old fashioned detour, swinging over toward the Hungry Horse Dam and around the back side of Martin City in a little loop right before you reach the lodge. The road circles through stunning national forest land to give you a taste of the area before popping out on Highway 2, where the lodge will be a few hundred feet up on your right. Note: We advise checking road and weather conditions before taking any of these routes, particularly in the winter months when there may be snow and ice on the road.